Always up for a foodie adventure, my friend and I met for lunch at Grezzo. We started with the Green Drink and a house tea. Both were quite interestingly flavored. The tea had lemon, goji berries, mint, ginger and probably some other fresh ingredients as well. The only drawback was that I had trouble drinking the liquid with all of the seeping items filling my mug. The green drink was a nice mix of vegetables topped with some delicious spicy edible flowers. I had the home-made "gnocchi" made with ground nuts and possibly tahini. These were artistically enveloped in a delicious "rawmesan" sauce made with coconut milk. The sauce was creamy and flavorful, going quite well with the crisp English peas and pea shoots. I don't remember the crispy eggplant being on the plate (although it appears to be on the menu). My friend had the BLTA wrap, which had a tasty, but slightly salty tortilla made from flax seeds and sundried tomato. The filling was quite good - fresh lettuce, tomato, avocado, creamy "cheese" spread, and a salty olive (or maybe eggplant?) paste. The ultra-light dehydrated chips on the side were delicious. Our wonderful server suggested the iced "eggnog" which was a delicious blend of nuts, coconut milk, topped with a fabulous vanilla "ice cream" and shaved Brazil nuts. That was dessert in of itself. We also opted for the Apple Pave which consisted of paper thin slices of apple stacked and topped with a citrus marinade and a caramel-like sauce served with clove ice cream. I found the clove flavor of the ice cream to be a bit overpowering and the apples to be too sweet for my taste. However, combining the flavors of each item was still quite good (I'm just not sure I would order this again.) The Chocolate Super Cookie with Chocolate Frosting was similar to a homemade Luna bar - somewhat dense and chewy (made with chocolate and dates). Not my thing, but maybe others would appreciate it. The frosting was delicious. Grezzo is a *tiny* little place with chairs that barely fit people with a slim stature. Squeezing into seats was a bit uncomfortable and difficult when the restaurant began to fill up. The kitchen is equally tiny and the one bathroom is oddly located right next to a prep station. So close, in fact, that I could hear the chef discussing her falafal recipe with a patron just on the other side of the bathroom door. Not sure if I would go back, but this place is definitely a fun and interesting experience. I wouldn't say I'm a convert to the raw food/vegan movement, but I did appreciate the creative use of fresh ingredients. 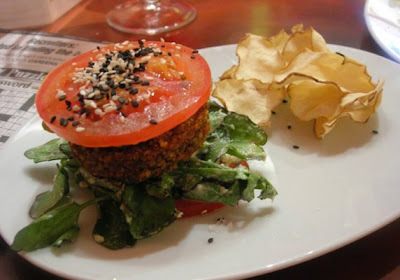 I would recommend the place to any vegan/vegetarian looking for something fun and upscale. My personal opinion is to stick with the appetizers and main courses and pass on dessert. One of the places I've always wanted to try in the South End, is Oishii Boston. I've been to the one in Chestnut Hill many times, but heard that the Boston restaurant serves some intriguing upscale items. Seeing as I was home for the holidays, we tried the place out for lunch. I *highly* recommend the New Kaiseki Lunch #1. It was fantastic considering the price ($30 fixed). The green salad with sesame dressing was good - nothing special, but the dressing was delicious. Then the platter of small plates arrived. OMG. The lobster wild mushroom risotto was fantastic - a nice chunk of claw artistically arranged in the middle of creamy, delicious (sushi rice?) risotto. The seared salmon with sweet soy was also really well done - not overcooked and perfectly flavored. My personal favorites were the crispy rock shrimp lemon aioli (perfectly fried teeny shrimp with a ton of flavor) and the grilled miso black cod (perfectly cooked luscious fish in a light fantastic broth sauce.) The crab cake was a little bite of yummy crab crispiness, and the sushi/sashimi were fresh and well prepared. The spicy tuna salad handroll was a large cone of flavorful well-seasoned tuna salad. 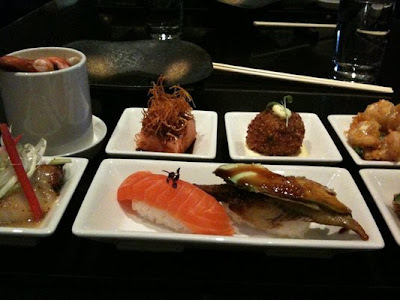 We also ordered a small selection of sushi a la carte. The foie gras with truffle was melt-in-your-mouth delicious (although quite expensive at $15/piece.) The rest of our random sushi selections were excellent, but again, very expensive. Oishii Boston is set a little out of the way in the South End. When we were there for lunch on a Tuesday the place was pretty empty. The space is dark, swank and modern. Certainly a classy place and a good option for a business luncheon. Given that Oishii in Chestnut Hill also has a fantastic selection of unique and delicious sushi, I would probably opt for take-out there rather than splurging on the very expensive Oishii Boston menu. That being said, the lunch special was entirely worth it. 1. A BIG winter coat. Forget fashion - you want something thick, puffy and preferably ankle-length. People may look at you funny, but when the negative wind chill strikes and blows from January through March they'll be wishing they were you. 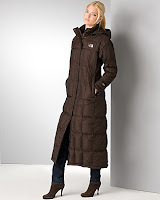 I recommend the Northface Triple C Long Hooded Down Jacket. It's like wearing a walking sleeping bag. While this is not quite as puffy as some other coats, the ankle-length feature is key for the really frigid days. Wear a thick sweater underneath if the windchill is really kicking in. 2. 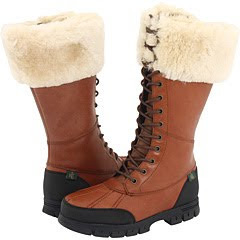 A pair of water-proof, fur-lined boots. 3. 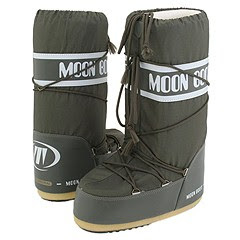 A pair of Moon Boots for shoveling the driveway. So I take back my last statement. Sometimes, you do have to forgo fashion in order to fulfill a function. After spending my first blizzard shoveling the driveway in rainboots I realized I needed something a little more substantial to get me through this Iowa winter. Moon Boots are amazing. As far as I can tell they are just gigantic spongey puffs in which to put your feet. There isn't even a "left" or "right" foot. Wearing them is like walking on puffy clouds...ah. These might even be one of those boots that are so ugly they're cute. 4. A LARGE flat screen TV. One of the first things we noticed while house-hunting in Iowa City was that every single household had an enormous flat screen TV. Some houses had more than one. How odd it seemed after coming from a world where most people had hand-me-down TVs that they huddled around during football or baseball games. Back in Cambridge, large flat screen TVs were more of a novelty than the general rule. Not so in Iowa City. Everyone and their grandmother owns a 50-inch or bigger. 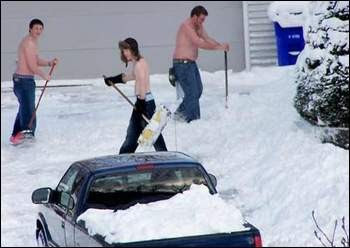 After surviving our first blizzard I now understand why. When it's -5 degrees outside and no one in their right mind would set foot in the ice covered world outside, what else is there to do but watch TV or play video games. In fact, TV and video games seem to be a way of life out here - people actually get together for the sole purpose of playing Halo or Rock Band. Like I said, we're learning to adjust. Images lifted from www1.bloomingdales.com, and zappos.com. Every year for Christmas I've wanted to have a real Christmas tree. I love the smell of pine needles and the sight of twinkling colored lights. However, just like the snow that I spent THREE HOURS shoveling off my driveway earlier this week, some things are just not worth the effort. 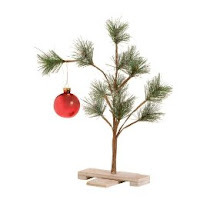 So this year I went to my neighborhood Walmart and picked up a Charlie Brown Christmas tree in-a-box. I'd spotted one of these on the receptionist's desk while waiting in line for my annual flu shot and decided I had to have one. After lighting a Thymes Frasier Fir candle I can sit by my little fake Charlie Brown Christmas tree and be thankful for all of those pine needles I won't have to vacuum. February 1940. The main street in Iowa City during a snowstorm. This weekend we had our first real snowfall of the year (or at least a snowfall that stuck around long enough for me to appreciate it!) I've always loved the way the world looks when it's covered by a fresh blanket of white. Ah...remember those days when you would wake up to the sound of the snow plow and hope-against-hope that it might be a snow day? Of course, here in Iowa City, we don't actually see snow plows all too often. 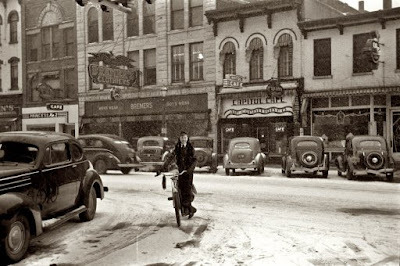 Rather than plowing in the wee hours of the night or early morning as most New England towns, Iowa City seems to wait until the snow melts on its own. I have heard that the city stocks enough salt for the year to last about a month in New England (please note: Iowa does not get LESS snow/ice than New England - you do the math.) Given that the midwest is known for its ice storms, this really doesn't make any sense to me, but I guess I don't make the rules. Even so, the first snowfall is still a magical day. If only I could spend days like this at home, drinking (spiked) hot chocolate and reading a book! Images lifted from shorpy.com, and blogs.uconn.edu.